Little Tummy is the first digital vertical children's food brand in Europe. We deliver fresh, organic baby foods straight to parent's doorstep, making busy lives of healthy families a bit easier. Using HPP (High-Pressure-Processing) allows us to produce healthier foods for little ones. Opposed to common, heat-treated baby foods we can keep all essential vitamins and natural tastes of our products intact. Nadine founded Little Tummy last year in London, believing that fresh foods and healthy habits are one of the most important foundations for life. 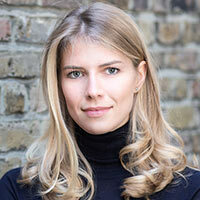 Before Little Tummy, she co-founded the Berlin-based Startup IAWIE, and worked for companies such as Axel Springer SE, Bertelsmann and Mister Spex, developing new business and marketing strategies for US and European markets. She holds an MSc in Management from Imperial College London. Currently, Nadine lives in London where she enjoys being part of the vibrant food tech environment.